To enter this website you must be at least the legal drinking age of 18 years. Serbia as a crossroad of cultures and a place where East and West meet, is a homeland of unique and unforgettable experiences. Taste of fruit, sweet raspberry and juicy plum, is mixed with healing herbs thriving only in intact nature. 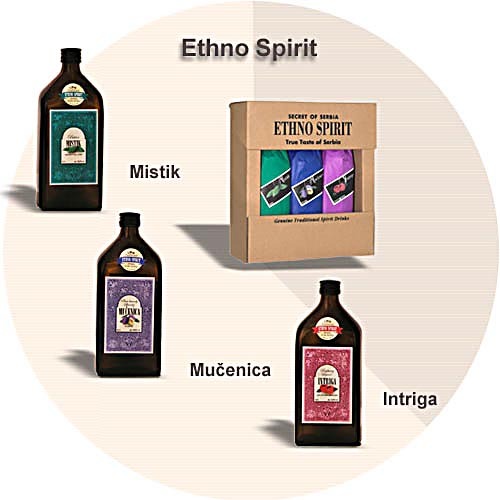 Every bottle of Ethno Spirit unites months of hard and patient work with traditional methods of spirit making. Fruit used in the process ripening without any kind of chemical treatment, healing herbs which are gathered and dried in a completely natural way using traditional techniques along with the recipes which are a part of the secret cultural heritage ensure that every bottle of Ethno Spirit is an unforgettable and inimitable experience. Exclusive gift uniting sweet female spitrit Intriga, sharp and strong male spirit Mučenica and a universal and healthy bitter Mistik. Ethno Spirit embodies the spirit of Serbian people who believe that life is all about living each day at a time, enjoying little, everyday things not taking anything for granted. These three national drinks will provide you with an insight to a distant and mystical Byzantium at the same time not taking away traditional hospitality of Serbian people. Plum brandy Slivovitz is a national drink, one of the best and most luscious brandies ever, wooing connoisseurs round the world for centuries. People called it Mučenica (martyr) because of its long, complicated and painstaking process of obtaining a single bottle of it. This brandy was produced as early as VII or VIII century AD from the selected types of plumes Prunus Domestica. Aside from plumes Serbia is known for its raspberries and raspberry fields. This fruit is used for making sweet raspberry liqueur Intrigue. Recipe for this remarkable and unusual spirit was, and still is, entrusted for centuries only from one generation of a family to another. Bitter Herbal Liqueurs is directly associated with centuries old Serbian customs of collecting healing and aromatic herbs and making of herbal brandy based on plum brandy flavored with herbs. Bitter liqueur "Mystique” is flavored with 54 carefully selected healing and aromatic herbs collected on Serbian mountain ranges and plains. Every bitter is considered to possess healing properties because it incites the appetite and aid the digestion. Launch on an extraordinary and inspiring journey into this beautiful and tame but still unexplored part of the world and experience the very soul of it whilst consuming these spirits.